It was just ten days following his third birthday. He had been exhibiting signs of the flu for almost the entire ten days since his birthday and was getting increasingly sicker. His mom had taken him to the doctor twice and each time been told if was just the flu. The date was June 10, 1953 and it represented the birthday of the person he would later become. I was that little boy and I was three years old. I have very few memories of actually walking and that day is one of the few. I had started walking down the hallway between my bedroom (a bedroom shared with two siblings) and the kitchen. I was whimpering and telling my mother that I didn’t feel well when I collapsed. I couldn’t get back up and I felt like crap. This particular day also holds one of the most vivid memories I have involving the early days of my adventures with polio. My mom came running out of the kitchen to see what the problem was. My siblings, both younger, were down for their nap. At that time in my family I had one 6-year-old brother, a younger sister and an even younger brother. Mom had three of us at that point less than three years old so it was no easy task to run off with a sick child. My dad was at work. I don’t know for sure but I suspect my aunt came over to take care of the other kids while my mother took me to the hospital. She had called our family doctor and made arrangements to meet him at the hospital thereby eliminating the step of having to go through emergency. After all there was a major polio epidemic happening in Winnipeg in 1953 so there was no sense in playing around with the idea of flu anymore. I became one of over 2300 reported cases in Manitoba in 1953. 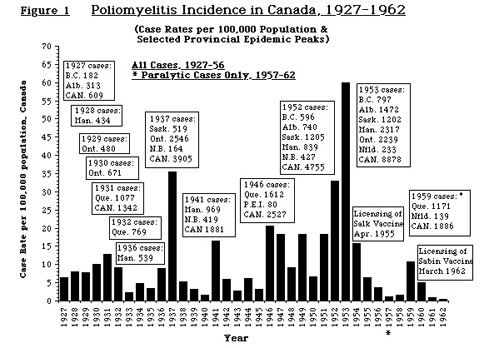 Polio outbreaks over the years. Winnipeg is infamous for very hot summer so the weather just compounded my fever. I remember being carried into the hospital hallway and feeling how cool it was compared to outside. We wound up in some hallway somewhere. I can still almost smell the antiseptic in the air. I was feverish but the hospital hallway was cool. The floor was dark forest green linoleum and the walls were dull beige. There were no windows so the hallways were rather dull and shadowed. It was mid afternoon so the lights hadn’t been turned on yet. It is that same type of optic effect you experience when you drive from a sunny highway into a short tunnel. It’s not really dark but it is not as bright as it was. This was kind of nice because I do remember a headache and light sensitivity so the dullness was appreciated. A nurse in a starched white uniform took me from my mother and carried me down to an examination room. The nurse had removed my clothes and laid me on the exam table wearing only my underwear. The exam table had dark brown Naugahyde upholstery and felt cool to my feverish skin. There was a small table beside it with a silver metal tray on top of it covered with what appeared to be a towel. I was sobbing more than crying and the nurse was doing her best to keep me calm. I didn’t know where my mother had gone. The nurse had also taken my temperature rectally using the thermometers’ that use to have mercury inside them. When the doctor entered she mumbled a few things to him that were beyond the comprehension of a 3-year-old. While he removed the cover from the metal tray next to the examination table the nurse unfolded a very starched and stiff green sheet. It had a nicely stitched open square right in the middle which she positioned over the small of my back. It really held little interest for me except it was cool to the skin when she placed it over me. She had also position me so I was facing the wall on my side with my back to the doctor. I had no idea what was going on but I did keep asking for my mother. I had no idea what a spinal tap, medically known as a lumbar puncture, was or even that it was about to happen. I do remember how cool it felt when the doctor used a gauze strip to wipe a red antiseptic over the lower part of my spine. I later discovered it was called Mercurochrome and I would see a lot of that red stain in the next fifteen years. At the time it just felt good because it was cool and I was quite feverish. I wasn’t quite sure why and I probably didn’t really give it much thought however the nurse leaned over, pushing her body against my upper torso, pinning me to the examination table and just started telling me to relax. In that instant it felt like someone had driven a railroad spike into the small of my back. I’m not sure what a railroad spike would really feel like but this pain just took me out of this world and into a realm I would wish on no one. I screamed! Large inflexible spinal tap needle usually sharpened with a hand file prior to using. This was 1953. The idea of flexible needles was still sometime in the future. These were still the day where nurses carried little files and sharpened their needles. All I know was that I had just been stabbed in the back with the equivalent of a railroad spike. It probably didn’t last as long as I though however in my mind it went on forever while the nurse kept me from squirming with her body weight. They had to drain as much spinal fluid as possible in order to get as much as the virus as they could. I know my mother still talks about how she could hear me screaming from her seat at the other end of the hall. She was in tears and there was nothing she could do about it. I never did make it home that day while the person that had been never left that table. I now mark June 10 as the birthday of the person I am today. The person who was born May 31, 1950 ceased to be on that table. Polio does that. This entry was posted in Disability, Personal Life and tagged activist, independent living, Just one man's opinion, living with a disability, polio, Terry Wiens, vaccinations. Bookmark the permalink. This is a rather poignant story about polio, Terry, and I look forward to more stories in your ongoing narrative about how this virus changed your life.